Contemporary paving offers much more to homeowners than the products of a few decades ago. There are now many styles and designs which are suited to modern homes with gardens that have an up-to-date style. Whether you are looking for a new patio or a system for creating a contemporary pathway through your garden's borders, there are many new products to suit. Often modern-style paving products have a sleek look which look great whether they are seen next to brickwork, grass or floral beds. The design concept of many modern outdoor paving products is to work well in a myriad of settings, allowing for a continuity of design throughout and entire garden. Many of the paving slabs used in North American homes today offer a natural look, which gives them the appearance of having just been quarried. Affording a smart appearance, paving slabs can be fitted in patios, terraces and over water features - like contemporary stepping stones - in some cases. Textured paving slabs are a popular choice for American families because they reflect the light in different ways as the sunlight passes across them. In addition, textured slabs are often able to provide a good amount of grip when they are stepped over in wet conditions. 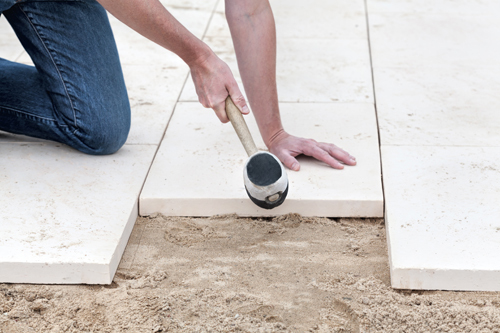 Most paving slabs are set out in a uniform pattern, because they are either rectangular or square, with mortar being used between then gaps to fix them in place. Large and heavy slabs that are often used in modern settings don't tend to shift around very much, so it is fashionable to install them with very little mortar indeed, therefore presenting a highly uniform look. When they are laid, paving slabs should be flat and preparing the ground beforehand is essential to make sure that it is level. Where steps are required, modern paving slabs tend to be installed with a chic section of overhang. This tip can be used to create anything from attractive single step up to a short flight of stairs. Modern paving slabs offer great textural differences but they are also available in a wide number of colors and hues. From dark natural slates to twinkling granites, slabs in yellows, creams, reds and even blues are on sale from specialists. Feature paving sometimes makes a show of using colored slabs in certain areas of a contemporary garden to create the sense of being in a room, rather like stepping on to a different colored carpet within a home. Poured concrete is one of the simplest ways of creating a patio or a base for an outbuilding, such as a summerhouse or a gazebo. However, concrete paving tends to be sold in sections these days and installed in much the same way as paving slabs. The great thing about concrete that is laid out with mortar is that it can be prefabricated to fit into very tight areas or awkward shapes. For example, modern concrete paving manufacturers can design bespoke slabs which will fit around a circular water feature, such as a fountain or a pond. In addition, concrete paving can be made in small sections that makes it easier to fit than large granite or slate slabs without the need to cut it to size. Concrete paving basically comes in one color only - gray. However, some modern garden designers make a great deal of the different grays that concrete can be made in. From almost white grays through to near black, concrete can work very well when it is installed in complementary tones to create dramatic effects. For example, some concrete pathways are made in light gray but have edges which are set out in dark gray - a stunning effect when pulled off correctly. A simple block of gray in a rectangular concrete patio can become much more of a feature when the tones of concrete in it are used to create geometric or even abstract designs. At its simplest, an interlocking paving lay out is when rectangular shaped slabs are set onto the ground much like brickwork on a wall. Nevertheless, this is far from the only interlocking paving design utilised by contemporary garden designers and landscape architects. Some paving manufacturers now make slabs which come in various sizes of rectangular shapes which have been cleverly designed to sit together attractively. Some slabs' dimensions, for example, are one third of the length of other slabs. Others will be two times as long as others. This means that they can be installed, almost at random, but with the ability to join up edges together at desired points, for example where the interlocking design needs to meet a fixed line, such as a wall or a pathway. Much used on driveways, this sort of design is also ideal for patios and for sun terraces surrounding swimming pools. Mosaic style interlocking paving is also available. This is made with a back-fitted membrane which allows it to be laid out easily. When fitted, this style of interlocking slabs appear to have been set out individually, but they take a fraction of the time to install. These products are similar to mosaic tiles made by bathroom manufacturers and don't need specialist skills to fit.